So, who's ready for the big game? My team isn't in it this year, so I'll just be watching for the commercials. Whether you'll be watching to root on the players, or if you're like me and are just in it for the funny ads, one thing we can all agree on is snacks are the best part of the game. Greasy tato skins and hot wings are good and all, but I myself like a crunchy snack to munch on during the game. Chips can get boring after a bit, so I thought it would be fun to add in this Crunchy Cereal Snack Mix that I found in Golden Blossom Honey's recipe list instead. The great thing about this recipe is you can customize it to fit your own tastes. Since it has a very peanut buttery flavor, I knew tossing in some freeze dried banana slices was going to make it one heck of a delicious recipe. I mean, peanut butter + banana = true love forever, right? I had half a bag of a super fruit mixture left over and decided to toss that in as well. My mix had dried goji berries, blueberries, and pumpkin seeds, but you can toss in any dried fruit you like. The base goes well with practically all dried fruits and nuts, so there is no wrong combination here. 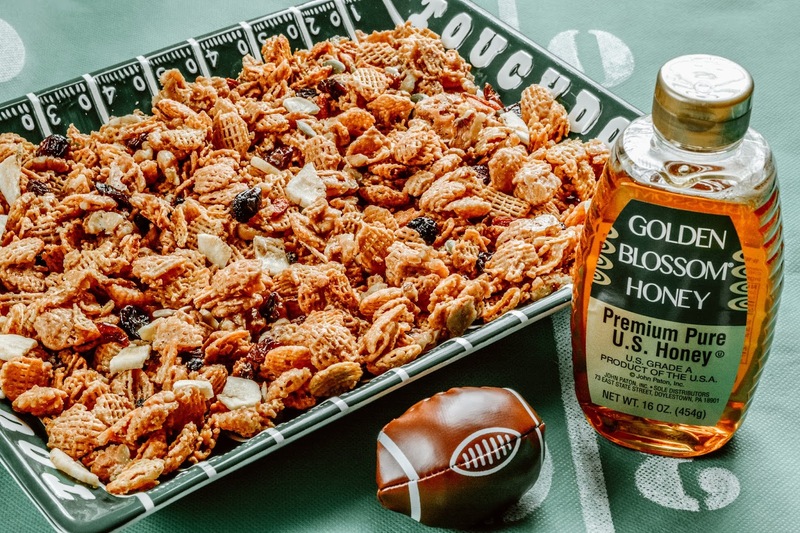 If you're looking for a lighter game day snack option or you just want something other than the same old chips and dip, add this crunchy cereal snack mix to your party food lineup. Trust me, you'll be glad you did! Which team will you be rooting for next Sunday? I watched somebody making a pigskin out of pizza dough stuffed with meatballs yesterday on Facebook.... it was utterly disgusting. yes, some of the food fugliness is actually fun over there, I follow Food Network's page there daily just for the hilarious comments on the fugly food that black lady and the model looking one cook and let us not get started on their shirtless chef.... ridiculous as much as I love seeing people shirtless. So Yummy probably has the tastiest page there. I don’t follow food network on Facebook, but I’ll check them out tonight. I do follow Tastys Vegetarian page though. Some of my friends share some of the grossest, heart clogging and cancer causing foods and act like it’s the greatest thing since sliced bread. And we wonder why we have such health problems and obesity here. Customizing sure is a win. Can't say I give two hoots, even one, about the super bowl though. I only give a hoot when it's my team. Otherwise, I'm rooting for anyone who's up against the Patriots. That looks so good! Crispix is one of my favorite cereals, and I love the natural sweetness of honey. This is a winner! I love Crispix too and tend to eat it dry right out of the box occasionally. Such a yummy snack, but even better in a recipe like this one. New England in. New Orleans out. The Broncos a total disgrace. Good snacks sound like the best part of the Super Bowl! These sound delicious, and I'm all for homemade snacks with the chance to customize. Have a good one! I agree, customizable snacks are good, but game day snacks are always great no matter what you're having. Have a great weekend Fundy! This looks like a tasty snack! The sweetness would be a nice finish after so many savory game day foods. Hello Theresa! I just usually pour in milk in a bowl of cereals. I've never thought of using honey with it. Thanks for sharing this. Most of the snacks we have for game days are rich. This will be just the thing to cap the snacking off. What a quick and yummy game day snack! I'll have to mix this up for my kids this year! 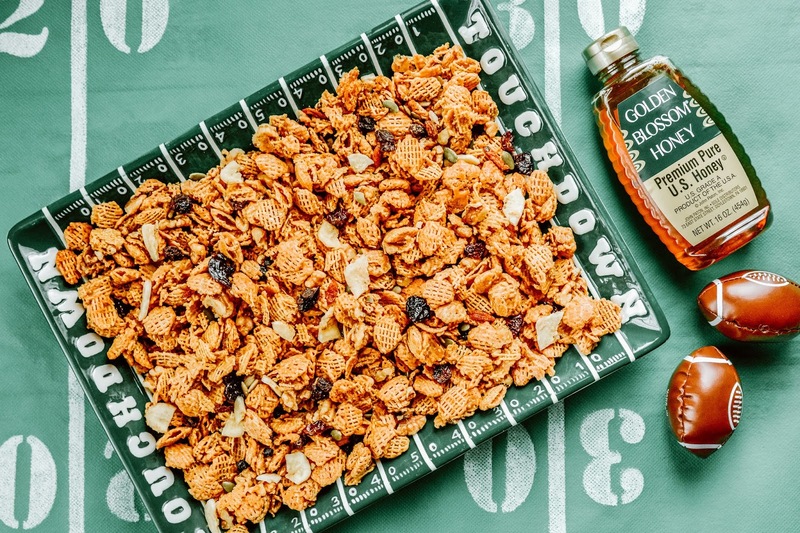 Adding honey to the cereal is a neat idea for a game day snack. Something to go with watching the Super Bowl. You always come up with great recipes using honey as one of your ingredients. This crunchy cereal snack looks perfect for my boys. My husband likes The New England Patriots. I had a lot of friends that were big about the other team. I don't really care, but I'd love the food! I love crunchy mix like this! I am excited for all of the festivities of The Big Game Day I am in Atlanta too. This is going to be a winner in my house. As much snacks as we go through every week, I am running out of ideas of what to give my kids. This crunchy cereal recipe just came in time. Thanks for sharing!